We have a new writer to add to our to-read list! Stephanie Osborn is an award-winning writer with such a colorful and interesting background that she is also known as the Interstellar Woman of Mystery. Stephanie is a rocket scientist who has worked on projects for space shuttles and the ISS, as well as military space defense projects. She's also been a police officer and is a National Weather Service certified storm spotter. Here's a press release on her brand new series, Division One, which sounds a bit like X-File/Area 51. Chromosphere Press Announces the Latest from Stephanie Osborn! Stephanie Osborn, aka the Interstellar Woman of Mystery, former rocket scientist and author of acclaimed science fiction mysteries, goes back to the urban legend of the unique group of men and women who show up at UFO sightings, alien abductions, etc. and make things...disappear...to craft her vision of the universe we don't know about. Her new series, Division One, chronicles this universe through the eyes of recruit Megan McAllister, aka Omega, and her experienced partner, Echo, as they handle everything from lost alien children to extraterrestrial assassination attempts and more. Dr. Megan McAllister was already a pretty unique human — NASA astronaut, professional astronomer, polymath — when she encountered the man in the black Suit that night in west Texas. What Division One Agent Echo didn't know, when he recruited her to the Agency, was that she was even more special. But he'd find out, soon enough. 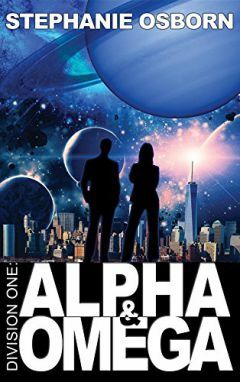 Book One, Alpha and Omega, will be released in ebook formats on 10 January, 2017, and in trade paperback format on 24 January. Additional installments in the ongoing series are anticipated later this year. Alpha and Omega ebooks are available for preorder at Amazon (Kindle) and Barnes-Noble (Nook). Other formats, and trade paper, will be available from your favorite bookseller! Stay safe and warm this weekend, and read a good book!